October 12th: Our shipment arrived from Oakland, CA with all of our things. We had just 6 days to get the boat packed and ready to cruise. The last time we prepped to cruise, we spent one year packing, prepping and fixing our boat. 6 days felt a little rushed. Each of the stops we made on our 25 day cruise down the East coast. 1. October 18: We left Barrington, Rhode Island in the evening, headed for Palm Beach, Florida. Based on mileage, we thought this would take 7-10 days cruising the Atlantic Ocean with maybe a stop or two. We were proved very wrong by the weather. 2. October 19: Stopped in Port Washington, NY for the night, and timed our exit the next day to pass through NYC with the tide in our favor. This was an inside passage we knew we wanted to do and then hoped to cruise the ocean the rest of the way. 3. Oct 20: Cruised through Long Island Sound, into NYC, past the Statue of Liberty and the UN buildings. It was windy and choppy, but still an amazing day. You'll see #3 twice on the map because we had to switch marinas after entering a marina at Sandy Hook, NJ that was much too small for us. A ripping current pulled us into the breakwater, denting a flopper pole on the starboard (right) side of the boat. They then squeezed us into a slip between the dock and piling where we clearly didn't fit, and it was bad weather, so it wasn't somewhere we wanted to be. ALSO, when we plugged in the boat, the breaker kept tripping, even though we didn't have anything turned on. So we switched to Atlantic Highlands, NJ where we fit just fine. Our Nordhavn flag flew off in the strong winds of Long Island Sound. We later found it in our back cockpit! This is the UN building. At times, this East River is closed during sessions. Luckily, today it was open. Oct 21: A cold front moved in, blowing strong winds, so we couldn't go anywhere. Another night in Atlantic Highlands. We did boat projects and walked to the market with knit hats on it was so cold. Simple boat projects always seem to turn into BIG ones. 4. Oct 22: Took off into the Atlantic Ocean. We left in the dark of the morning so that we could get to our next location, Cape May, NJ during daylight. We were so tired once we got there that we ordered Uber Eats. They had a nice pool, but it was way too cold to use it. This is why we didn't go cruising today! 5. Oct 23: We left Cape May through the Cape May Canal. We couldn't cruise outside because of a cold front. So we began to cruise the waterways. All of the east coast waterways are very shallow, this canal included. They often have channels that are dredged to 9-12 feet (our boat has 5.5 feet below the waterline). As we traversed Cape May Canal, near the ferry terminal, we came to a red buoy and kept it to our right, like we are supposed to do when heading south in the east coast waterways. Just as we started to pass, a voice came over the VHS "Uh, captain, you're on the wrong side of that buoy, you're going to want to come to the other side." THUD. We hit the mud in the bottom of the canal. Pat calmly says, "Yep, we just hit bottom, we're stuck"
"You're going to want to go in reverse exactly the way you went in, pivot and come to the other side of that buoy"
Pat did a great job of calmly backing up our 80,000 pound vessel, pivoting and heading to the right side of that red buoy. You see, grounding is very normal over here. The bottom is soft sand and mud and it often shoals and moves. You won't hurt your boat when you hit bottom, and you just hope you don't get stuck and have to get hauled off by a tow boat. In addition, depending on which waterway you are on, sometimes the red is on your right, sometimes it's on your left....helpful. Still, this was very unnerving for us and made us very watchful while traversing the rest of the waterways. 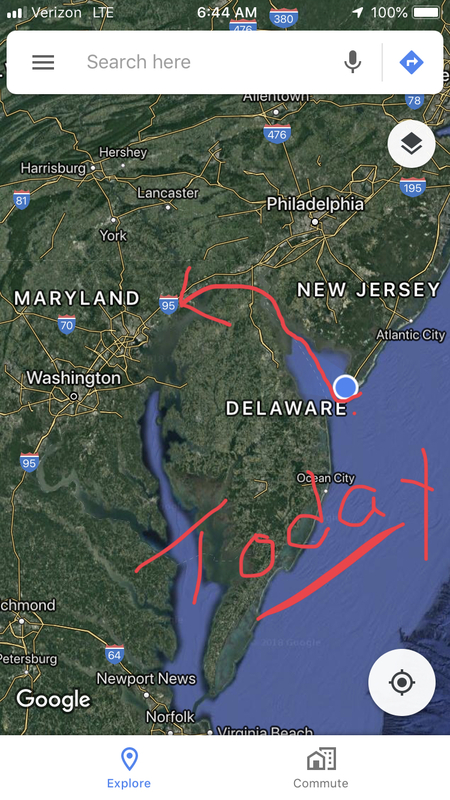 After the canal, we went up the Delaware Bay and into the C & D Canal (Chesapeake & Delaware) which was much wider and better marked. We stayed in Chesapeake City, MD in the canal. This canal was originally a creek, but was dredged out as a major shipping channel in the late 1800s and now huge shipping containers pass through here. 6. 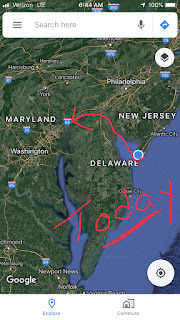 Oct 24: Leaving the canal, we headed into the Chesapeake Bay and into Annapolis, the capital of Maryland. We stayed at our first fixed dock that was so tall we had to climb out of the boat up onto the dock 3 feet above at low tide. Rigging fenders for these docks was a new thing for us. We would have loved to spend a few days in this Navy town. We had a great BBQ meal and flew the drone around a little. Early to bed since we were leaving at sunrise (again). 7. Oct 25-27: From Annapolis we cruised to Norfolk, the City of Mermaids. We knew another cold front was coming in, so we planned on staying here a couple of days. It would end up being 3 days. So we made the best of it. We re-provisioned our food, did some boat projects, visited the USS Wisconsin and their interactive waterfront museum, we went to a Halloween costume party and a concert by Runaway Jane (excellent up and coming country music artists). At this point, we knew we weren't going to make it to Palm Beach in time for our scheduled haul out to do the bottom paint on October 29th, so we rescheduled to November 9th. We should be able to make that! 8. Oct 28: With the ocean conditions still not great, we decided to start on the Intracoastal Waterway (ICW) a 3000 mile inland waterway that runs from Boston, around Florida into Texas. We had hoped to avoid this because many of the sections are VERY shallow and you can only run during daylight hours for safety. Also, many areas get so shallow that we can only run at high tide, really limiting our cruising hours. In addition, there are timed low bridges that we would have to wait for an opening to get under. But, if we wanted to move south, we needed to use the ICW. Our first ICW stop was in Coinjock, VA. We'd been hearing about this spot as a MUST stop, just for the prime rib. So, we reserved our slip and 2 portions of prime rib and made the stop. 'They' were right - it was the best prime rib we've ever had. Totally worth the stop. We were wedged in a long dock where we were the 'small' boat, with a huge anchor hanging over our back cockpit and our anchor hanging over the million dollar boat in front of us. Luckily, by this time, Pat has become excellent at maneuvering this boat and we were able to pivot out from between the 2 beasts at sunrise. 9. Oct 29: We made it to Bellhaven, NC before sunset. We were now coming upon regions that were recently hit by hurricanes Florence and Michael. Our marina was in the process of rebuilding all of their docks. They had a golf cart that we took to the Food Lion to re-provision (and get a pumpkin). However most of the restaurants were still closed from hurricane damage. The weather was starting to get warmer and today was the first day we cruised with our doors open. 10. Oct 30: We stayed on the ICW and made it to Beaufort, NC (Bo-fort). We could have stayed here for a few days and explored. There were dolphins surrounding the marina at night and wild horses on the island across from us. But we were feeling the pressure to get south, so we left this cute town behind. 11. Oct 31: On Halloween we were able to do a short cruise (with dolphins again) outside (in the ocean), but the decent weather wasn't going to last, so we pulled into Wrightsville, NC. We were too exhausted to go out to any local parties, so we watched the movie Halloween. 12 Nov 1 - 3: We took the ICW to Southport, NC where we knew we were going to have to wait for the weather again. We were really hoping to find a window of time to cruise outside. Fortunately they have a local meteorologist, Hank Pomeranz, who does nightly talks at the marina regarding the latest weather and the conditions of shoaling in the ICW. He was a wealth of information, and armed with his knowledge we finally left for an overnight cruise into the Atlantic again. 13 Nov 4: After 24 hours of cruising the waves were building and we had unexpected high water in our bilge. We needed to go in. So back to the ICW for rest and boat maintenance. We stopped at Skull River marina on Hilton Head, SC which is located in a country club. Exhausted, Pat and I walked to the 'Skull Island Pub' where we quickly realized we should find elsewhere since our boaters' attire didn't work with the white linen table cloths and the country clubbers. Clearly not a pub. After eating and long hot showers, Pat went to work on finding the source of the water in the bilge. He finally traced it to a loose fitting in the head under the sink. Fresh water from our tanks was leaking in the bathroom, passing through the drains and into the bilge. Once he fixed the fittings and drained the bilge, we were ready to cruise again! 14 Nov 5: We decided to set ourselves up to enter the ocean again, but today was not the day to head outside, another cold front. So we moved just an hour south on the ICW to the main marina on Hilton Head, SC (where the country clubbers wouldn't look at us with disdain). Great area made even better when the dock hand gave us a bottle of wine after he tied out boat up. We were greeted by dozens of dolphins as we entered and had a relaxing day here. 15 Nov 6-7: A warm 10 hour ocean cruise took us past sea turtles and dolphins. This was a pretty nice cruise with 3 foot waves spaced at 7 seconds or so, so not too uncomfortable for most of the time. We came into St. Simons, GA as the seas picked up again. Warm enough to be outside finally! Again, we realized we were going to miss our Nov 9th haul out, so they told us the best they could do was Nov 16th. Not ideal, but there was nothing we could do about it. Our 7-10 day cruise was turning into a month. Meanwhile, the ship heading to Mexico that we were looking at putting Noeta on, upped their leave date to Nov 19th. There was no way we could make that date, and get Noeta worked on in Florida, so we have begun talking to other shippers to figure out how to get Noeta to Mexico. 16. Nov 8-9: We again cruised outside for a long 34 hour stretch to Fort Pierce, Florida. There were more dolphins, Cape Canaveral and Space X. Hailey and I did have 2 close calls in the middle of the night near Daytona Beach with huge floating buoys that weren't marked on any of our charts. They drifted by, just 10-15 feet away. We were on high alert the rest of the night. It was finally 'Florida' warm and Pat and I enjoyed cold beer and cheeseburgers at a tiki bar on our dock. 17. Nov 10: LAST LEG! On our 24th day cruising, we decided to run the ICW since it would be 20 miles shorter than going into the ocean, through an inlet and north again to Palm Beach. Just as we were leaving Fort Pierce, we hit ground for the 2nd time. It couldn't have been an easy finish. We were able to plow through the sand this time and come through to deeper water (9 feet) on the other side. More dolphins today, a few drawbridges, lots of manatee zones where boaters can't make any wake and we finally pulled into Loggerhead Marina, our home base for a few days. We are in a marina surrounded by other Nordhavns, near Yacht Tech who is flexibly working with our ever changing schedule to do maintenance and the haul out. We are very happy to not be checking the weather every night and planning routes constantly. We've rented a car and plan on relaxing for a few days. Our original schedule was unreasonable with the continuous cold fronts that passed through the east coast over the past month. We wish we could have explored many of the areas and their history more thoroughly, but we were determined to get south. Now that we're here and waiting for a ship date and boat maintenance, we are going to snorkle, play on the beach, visit a loggerhead turtle sanctuary and of course, do boat projects. Where Gilligan spent much of the cruise.